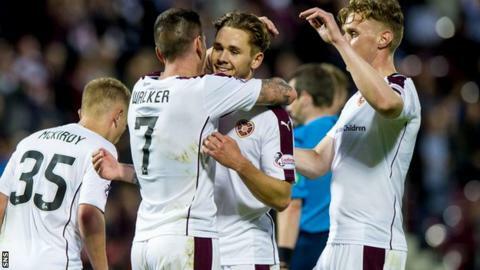 Hearts' return to the Scottish Premiership is "good" for the top flight's profile, according to SPFL chief executive Neil Doncaster. "There's real anticipation this year," Doncaster told BBC Radio Scotland. "It's good for the profile of the top tier to have the very biggest city clubs back." Neilson has said a top-six finish would represent success for the Edinburgh club this season. Doncaster believes the exciting drama of last season augurs well for the new campaign. "Who knows where Hearts will be this year? "The league never gets to choose the clubs that appear at any level of the game. Last year was incredible to have Hearts, Hibernian and Rangers - three huge clubs - in the second tier. "We welcome Hearts back this year and a lot of people will be looking to see how Robbie Neilson gets on." Doncaster also responded to reports that the SPFL has been inundated by complaints that all 10 in League Two clubs will be worse off as a result of corporate hospitality and advertising requirements in the ruling body's new £2m sponsorship agreement with Ladbrokes. "I read that I was inundated with complaints which seemed a bit hyperbolic," he said. "I had two clubs who emailed me with some queries on the deal. There is a concern about the distribution model and the way in which the sponsorship revenue is divvied up. "But the reality is that if you look at broadcasting revenue, that gets divvied up amongst all 42 clubs and League Two clubs don't put anything into that deal. "So, I think it's a fair distribution model and has delivered more money for clubs than under the old split league system - with the SFL operating independently of the SPL - I think the vast majority of clubs are delighted with the way the merger has panned out and the way the SPFL is operating. "The overall response I've had from the majority of clubs has been overwhelmingly positive."